Helpful feedback is essential to improvement, be it in writing or in software development. Our community of teachers and learners regularly sends us ideas on how Eli Review could better support their peer learning and we used a heck of a lot of that feedback this year. We had five major releases in 2017, along with a number of minor tweaks and improvements along the way. We have some exciting new features nearly ready for early 2018, but thank you to everyone who gave us feedback this year and for the continued support and collegiality. 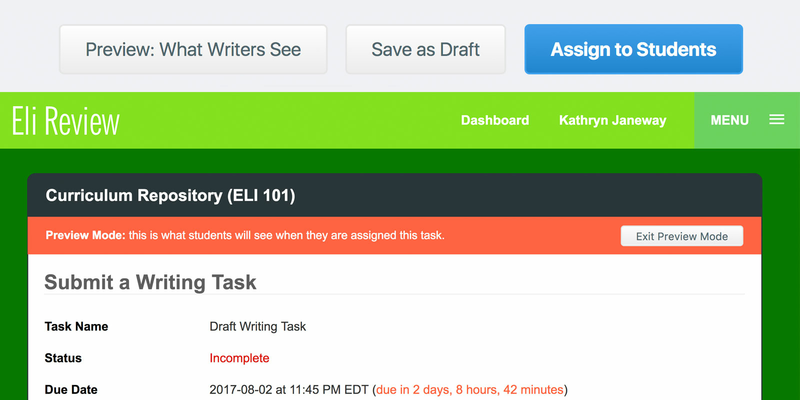 Our first new feature of 2017 was designed to let instructors see all students’ participation across all tasks at a glance. 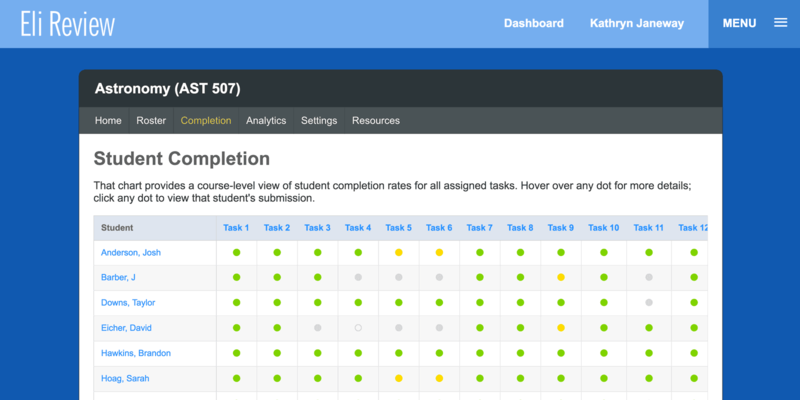 The new completion report is a table that combines a roster view with a dashboard view, where each assigned task has a column, each student has a row, and each cell indicates a student’s progress toward completing that task using colored dots like those in the current task reports. This release also included some small improvements to student and instructor revision plans. These are based on feedback from instructors who pointed out where students have struggled to understand how to build their plans.The biggest changes were on the student side, particularly new visuals cues for adding and arranging comments as well as streamlining how to add notes to a plan. See the full details of this new feature in the March 2 release notes. a preview mode for all task types that gave instructors an easy way to see what their students would experience when they were assigned a task. The preview mode in particular was an often-requested feature. Some teachers went so far as to enroll themselves in their courses to experience what students would see, so we were happy to finally be able to give them the ability to do that with no extra work required. See the full details of this new feature in the July 31 release notes. The new “tallied response types” in Eli’s review tasks were a surprise development but we think of the most useful of the year. While word counts and comment volume are ways to measure engagement, there had been no easy way to measure writer performance on specific criteria. 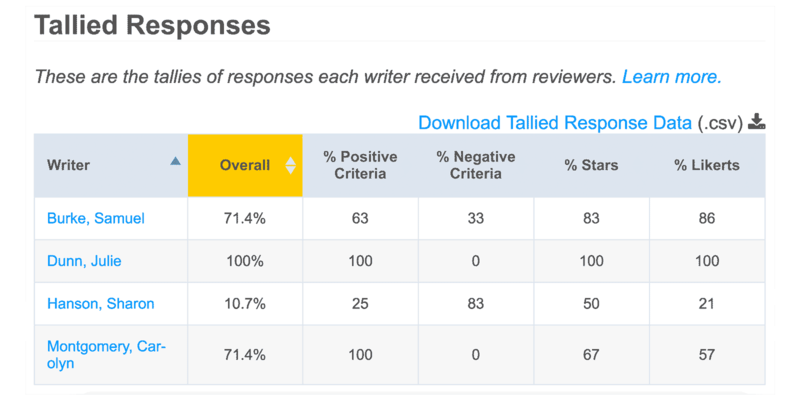 This new feature, enabled by clicking “tally response” on individual response types in a review, makes it easy for instructors to see how all of their writers are doing on individual criteria with a quick glance. These tallies help instructors quickly identify which writers need extra help to meet the criteria. See the full details of this new feature in the September 5 release notes. Our first steps to visualize the word count data we started collecting with our June 21 release saw those data points added to the engagement data report from an individual review. This change also saw 3 more new data points: word count < 20, a count of endorsed comments, and a count of comments added to revision plans. 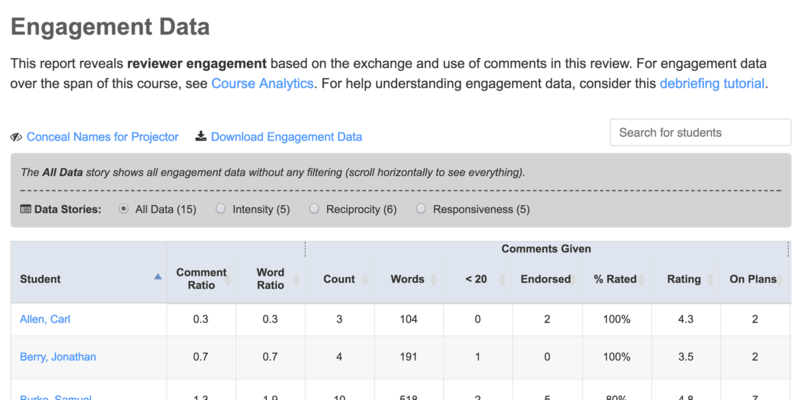 While we were adding these four new columns to our existing engagement data report, we realized that that table had become far too complicated when displaying everything we could about reviewer engagement. To help address that, we added a new “data stories” filter that rearranges the columns to help see different aspects of a reviewer’s engagement (Intensity, Reciprocity, Responsiveness). Instructors still have the option to see everything, but these stories help paint different pictures of students. See the full details of this new feature in the November 28 release notes. This feature, our last for 2017, addressed a hack that instructors previously used for sharing direct links to student activities. Now, on the instructor course homepage, each task has a link icon next to it and clicking that icon automatically copies the address that students can use to access that task. This makes sharing links to the tasks via email, LMS, etc much easier. See the full details of this new feature in the December 18 release notes. Revision Report: How Eli Review Got Better in 2017 was published to the Eli Review Blog in the category Uncategorized.